When something seems too good to be true, especially when that something is a cure to a centuries old curse, it probably is. 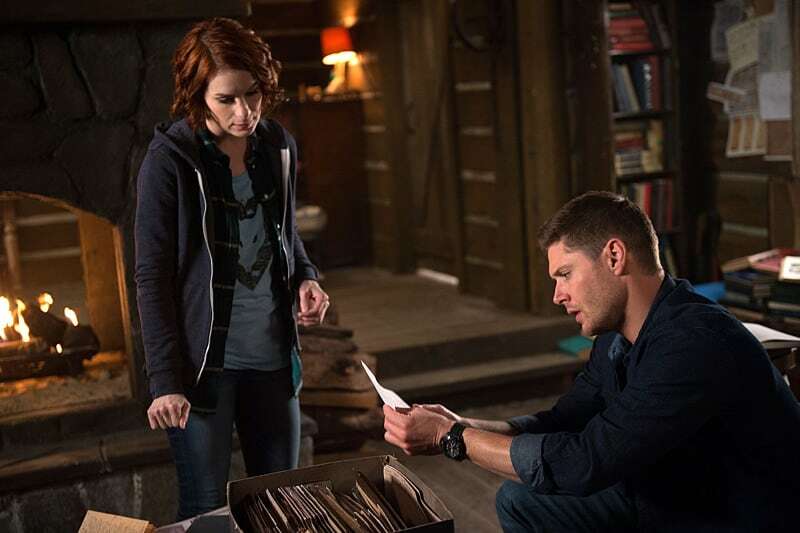 Our favorite redheaded hunter has finally found The Book of the Damned she set out to look for a few episodes ago, a powerful book of magic that supposedly holds a spell to remove the Mark of Cain. Unfortunately, she’s not the only one that’s been after it. A man named Jacob Styne has been tracking the book as well, going as far as to shoot Charlie in an attempt to get the book back in his family’s possession. The attempt fails (FORTUNATELY -- honestly, if Charlie ever dies, I probably will riot), and she calls up Sam and Dean, laying low at one of Bobby’s cabins while she waits for them to meet her there. The book seems to hold some sort of power over Dean from the moment he holds it. He immediately tells the others it’s not a good idea for him to touch it, and when not being used, they keep the book locked away in a box covered in protective sigils, as to prevent it from being tracked by Jacob. Sam and Charlie get to work translating it, only to find out it’s also written in code, but Dean believes they can crack it. It’s only as he deeper he digs into the history of the book and the Styne family, Dean quickly realizes using any spell from that book isn’t a good idea. It’s dark magic, and with every spell comes a price, a negative reaction of Biblical proportions. Ever since he laid eyes on the book, there has been a connection between it and him due to him bearing the Mark. He explains it’s almost as if the book is alive, and it’s been calling out to him, and the only thing they should do with it is get rid of it. It’s not safe in the hands of anyone, least of all him. Meanwhile, Castiel and Metatron are on a road trip to retrieve Castiel’s grace, though there are some bumps along the way as they find themselves facing off with an angry Cupid in a diner’s back alley. Metatron saves the angel’s life, but Castiel assures him it “changes nothing,” which, as someone who hates the former Scribe of God just as much as anyone else, I can definitely agree with him there. I’m so ready for someone to put Metatron in his place, as long as his place is six feet under. The two finally reach the library where Castiel’s grace is hidden, stashed away in one of the books, but the only way to find it is by answering a riddle to figure out the next book. Despite his better judgement, Castiel uncuffs Metatron, allowing him to venture through the aisles of shelves to help look for the book the clue leads them to. But of course, Metatron being who he is, has had a plan all along. Painting sigils with his blood along the spines of books, he casts a spell that encumbers the angel while he steals the demon tablet from another book in the library. Hardly able to move, Castiel still manages to push forward and figure out what the riddle is -- it’s a quote. Pulling out a Don Quixote book, he finds the vial of grace inside the hollowed out pages, returning his powers to himself, but not before Metatron escapes. After leaving the cabin to go for a drive to clear his head and pick up Charlie’s snacks, Dean happens upon Jacob and one of his men in a gas station. After a struggle, he manages to take down one of them -- but it takes a full clip of bullets in order to do so. He rushes back to the cabin to warn the others that the Stynes are on their way. They kill them, and Sam burns the book (though, we find out at the end of the episode, it wasn’t the book after all), and the four of them (Dean, Sam, Charlie, and Cas) enjoy a nice evening of beers and pizzas together. Both Castiel and Sam are lying to the others, Cas about Metatron being out on the loose with the demon tablet, and Sam about his ulterior motives with the book, but it’s still a sweet family moment between all of them nonetheless, one that nearly brought tears to my eyes, because let’s face it. How often do evenings like that come along for them? As for Sam’s choice in deciding not to burn the book, I don’t agree with it, but I do understand where he’s coming from. The brothers have never been good at letting the other go without a fight, because they care, even if they’ve said harsh words that seemed to prove otherwise. Sam desperately wants to cure Dean, even if that means dealing with disastrous consequences afterwards. Seeing his brother become a monster isn’t something he wants to relive, or have his brother go through again. Lying and going behind his back with the real book to Rowena seems like a terrible thing to do, I know. I see so much hate regarding Sam and his decisions, not just about this, but about everything else over the past ten seasons, but I don’t think those people really stop and THINK that that is the Winchester way. As predictable as it is, it’s what they both do, and will continue to do probably until the very end. It’s in their blood. Sam going behind Dean’s back is not the smartest route, I will admit, but if the roles were reversed, Dean would be doing the exact same thing, and neither of them are terrible people in doing so. They’re just brothers, doing stupid things to keep the other brother alive. "This is my life. I love it. But I can’t do it without my brother. I don’t want to do it without my brother." Metatron - “Really? That song is a classic!” re: Castiel turning off Alanis Morissette’s "Ironic" on the radio. “When was the last time either one of us was on a beach?” “Never?” “Never.” Let’s have a moment to remember that Sam and Dean never had a normal childhood with family trips to the beach. They’ve traveled back and forth across the states hundreds of times, and yet they’ve still never actually seen the ocean. Excuse me while I cry. Charlie and Cas’s hug at the end of the episode is probably the cutest thing to happen on the show so far. I need more scenes of those two together. Spin-off, anyone?